For those of you that were not able to make it to Enterprise Connect this year, I wanted to bring a bit of my perspective from the Expo Floor. 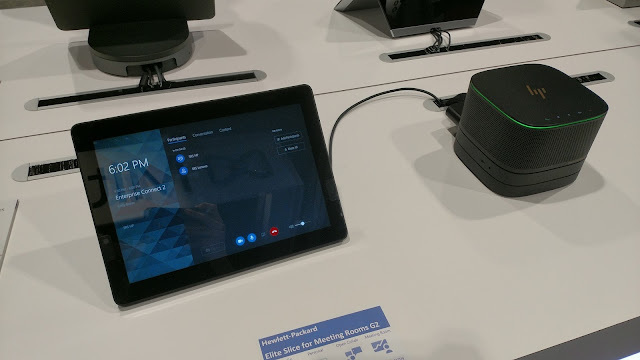 While there were some pretty big announcements blasted out via official Microsoft blogs on Monday, there is also a lot happening with several of Microsoft’s strategic device & solution partners – and much of this was on display on the Expo Floor. Let’s start with the Microsoft Booth. Ok, the “Skype for Business” portion of that title is more or less a courtesy, as Microsoft Teams has taken not just center stage, but almost the entire stage, at EC this year. 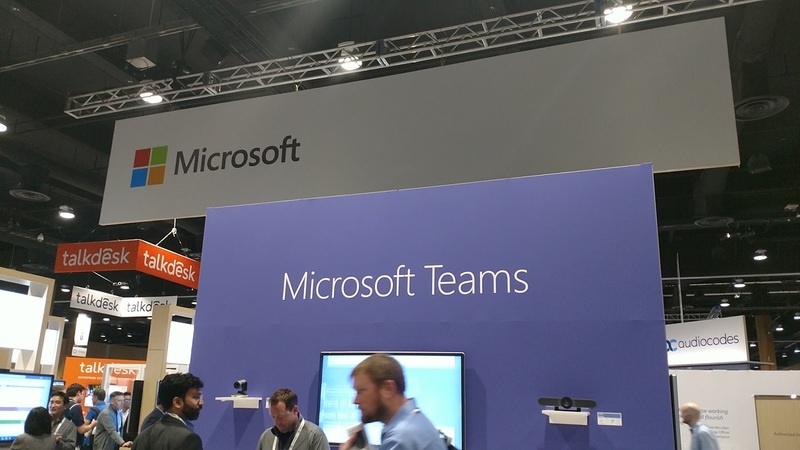 As you can see from the picture above, the Microsoft booth is painted Teams-purple this year, with Teams at the epicenter. While you had the impressive Hub displays all over within the booth, there were also several big screens set up for Teams demonstration purposes. The Elite Slice has a propped up display, with the familiar interface of the other SRS’s. The cube-shaped box to the right is the computing base with ports for external devices, and on top of the computing base is a large speaker. 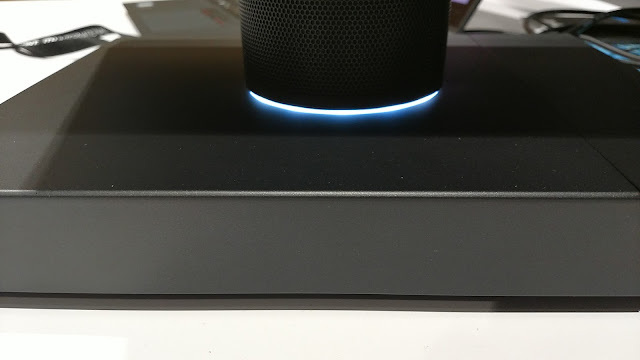 The speaker is actually optional, and if you get the base without the speaker, the base can be under-mounted to the conference table, allowing for a cleaner tabletop. I’ll provide an image or two of the Teams interface on a couple partner devices a bit later on, but Microsoft has a glass case at their booth, filled with various partner devices, all running a Teams interface. 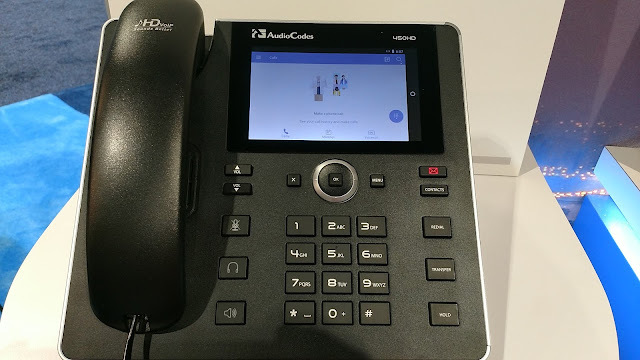 I must say, the Teams interface does look pretty slick on these devices, and I am excited to see this piece of the Teams transition story coming into focus. 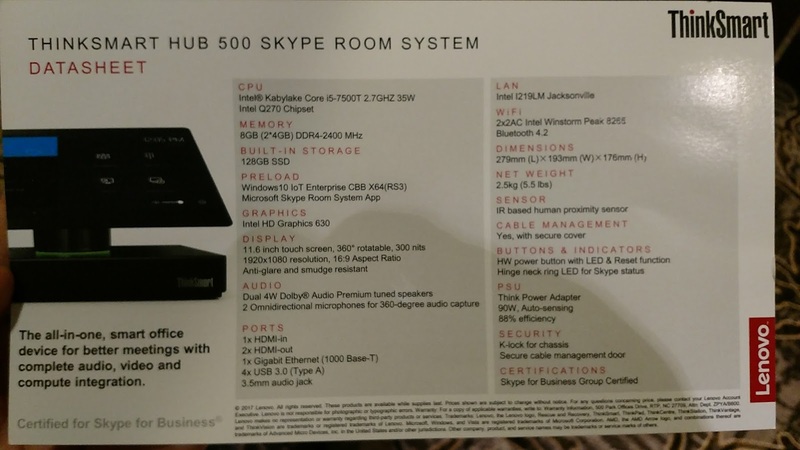 As mentioned above, I was able to stop at the Lenovo booth on Day 1 to get a closer look at a full SRS setup using the new Lenovo Thinksmart HUB 500. 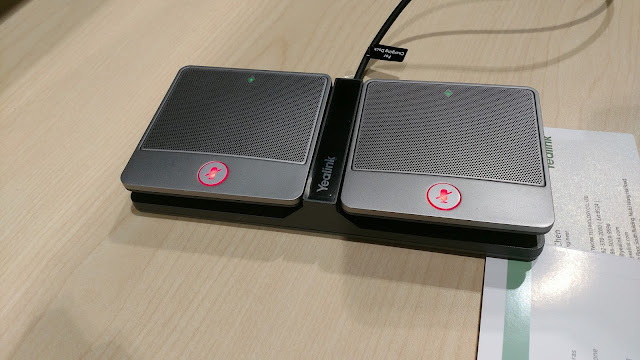 This device can swivel a full 360 degrees for ease of access on all sides of the conference table. 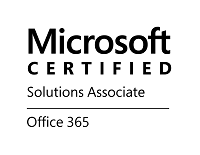 There is also a light that encompasses the base to match the Skype for Business status. One thing I personally appreciated about this device from an aesthetic standpoint is the beveled edges at the top and bottom of the display. As you might expect, this new interface has theming that is very nicely matched to the Microsoft Teams experience. The tabbed feel of the Teams menu is even present at the bottom of the phone, with Calls, Meetings, and Voicemail tabs present. There is also a Dialpad button on the screen, if you prefer to use an on-screen dialpad versus the physical keys, and contacts can be searched for with your GAL/Contacts through the search features in the upper-right hand corner. 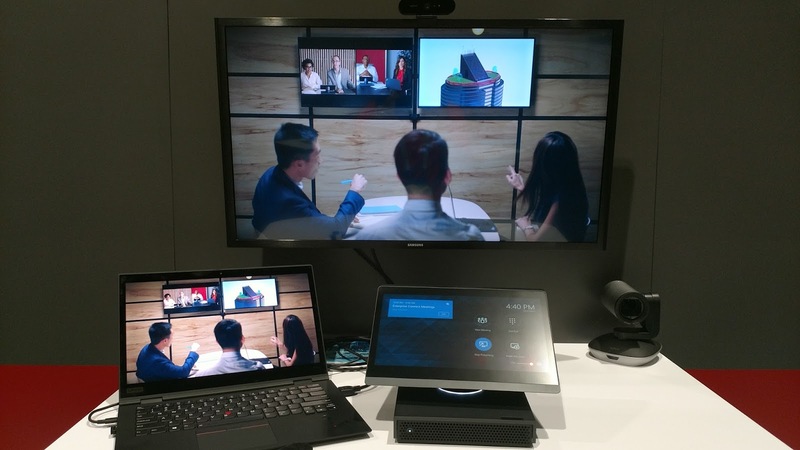 While the C450HD is a new offering for AudioCodes, I should note that this new Teams experience is very consistent across the other 3rd-party devices that are also previewing this experience (Polycom and Yealink). 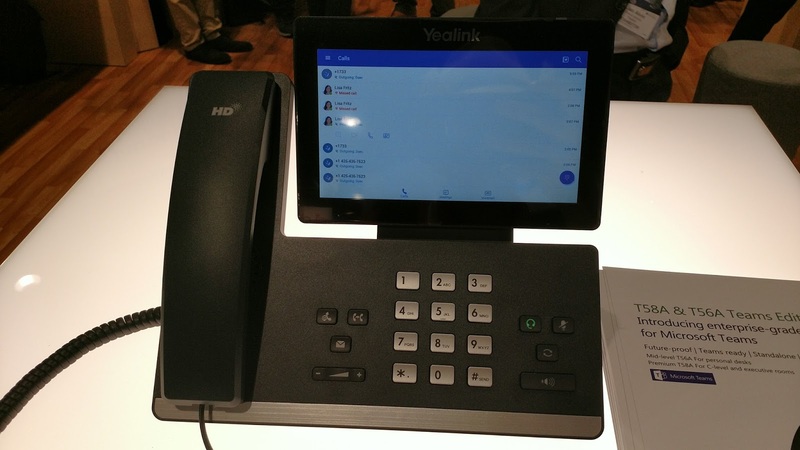 Shifting gears to the conference phone, Yealink’s CP960 Teams Edition was also on display, with a very familiar Teams experience. The interface brings a really “mobile phone” feel with it. 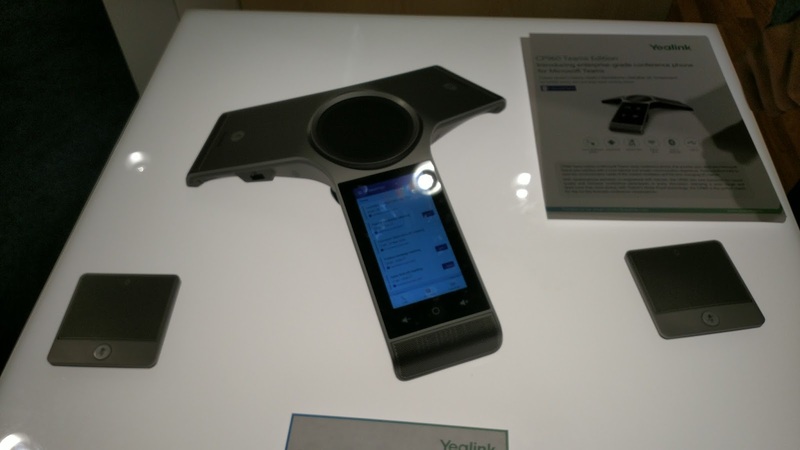 This was a brief summary of some of the device innovations that I was able to soak in during Day 1 of Enterprise Connect. 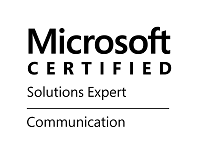 Stay tuned, as I will be spending the greater part of Day 3 on the Expo Floor, and will be bringing a short description of the new features and devices that I observe from the other partners out there in the Microsoft UC ecosystem!